Wanted: a Republican Senator willing to reach across the aisle and work with Democrats and the Obama Administration on a bipartisan bill on immigration reform that's already half done. The Democrats have been scrambling to find such a brave soul since Republican Senator Lindsey Graham left the talks after Dems shelved an energy bill he'd been working on. Democratic negotiators Chuck Schumer of New York, Bob Menendez of New Jersey and Senate Majority Leader Harry Reid have even unveiled the bones of the bill they'd hammered out with Graham in hopes of luring another Republican on board. "What [Republicans] said before the Democrats produced the framework was that they need to see the paper," says Frank Sharry, director of America's Voice, an immigration advocacy group. "Now that they've seen the paper, they seem to be finding other reasons not to sign on." Of the 23 Senate Republicans who voted for immigration reform in 2006, five have since lost their seats, six have retired, one switched parties and four more are retiring this year. Meanwhile, Bob Bennett of Utah just saw his nomination as GOP candidate upended by the state's Tea Party, and John McCain of Arizona is facing the toughest Senate race of his career. In fact, many in the immigration world believe that Graham walked away from the negotiating table in part to protect his dear friend McCain, who can ill afford a partisan brawl on immigration. The fact that McCain co-authored and voted for the comprehensive reform bill in 2006 is what got him into such hot water with Arizona Republican primary voters in the first place. So immigration groups are left wooing retiring Republicans Senators George Voinovich of Ohio and Judd Gregg of New Hampshire. They're also working on the two moderate Senators from Maine and Alaska's Lisa Murkowski: all three voted for the 2006 bill. President Obama called Republican Senators Scott Brown, Richard Lugar, George LeMieux (a Florida Republican who is finishing Mel Martinez's term until Sunshine State voters pick a permanent replacement), Murkowski and Gregg from Air Force One last month  but so far no one has signed on. "Although Senator Gregg is interested in fixing our broken immigration system and especially encouraging talented people to come here legally, he does not support any initiative promoting comprehensive reform until the President and this Administration get serious about controlling our borders," said Gregg spokeswoman Laena Fallon, explaining his reluctance to negotiate. To be fair, the first eight pages of the 22-page framework is about beefing up border security, and the Obama Administration has exceeded Bush Administration efforts on border control. 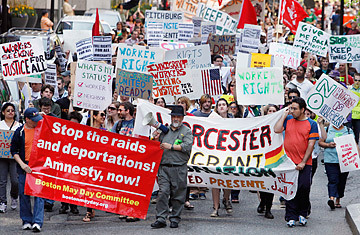 Last year saw the highest number of people ever deported: 387,790, up from 116,782 in 2001 and 349,041 in 2008. Thus far this year, some 185,887 people have been deported, a record pace that, if maintained, will nearly double the number of deportations in 2010 to 604,133. The Administration has also doubled the number of agents assigned to the Border Enforcement Security Task Force and tripled intelligence analysts along the Southwest border. In fact, the Obama Administration has gone so far to the right on enforcement that some immigrant-rights groups, already peeved at the lack of action on comprehensive reform, are calling for a boycott in the 2010 elections. It is a powerful threat. Latino voters are credited with helping Obama flip red states in the 2008 elections, including Florida, Nevada, Colorado and New Mexico. And Democratic candidates in close races in those states and in California, Texas and Arizona are hoping for similar high levels of Hispanic turnout as Dems look at potentially losing more than 30 House seats. To underline their clout, Latino groups are launching a massive voter-registration push. "We were so focused on the Census up until now, and the Arizona law just blindsided us," says Maria Teresa Kumar, executive director of Voto Latino. "In June, we're starting a voter registration effort that wasn't originally supposed to start until September." They're joined by unions and faith-based groups like the Catholic Church. Businesses are also seeking clarity on the issue, and an increasing number of law enforcement groups are unhappy with the patchwork of local regulations being developed in the vacuum of federal action. "The immigrant and Latino communities are looking very closely at what's going on, whether you're a Democrat or Republican," says Eliseo Medina, international executive VP of the Service Employees International Union. "What you do between now and November is going to be very determinative of how people are going to vote." Time is running out. Obama said on May 5 that he would like the Senate debate on immigration to begin this year, essentially conceding that it is unlikely to finish before the midterm elections. "The window of opportunity is beginning to close. If we don't have a bipartisan breakthrough in the next few weeks, it's going to go from being a possibility to being a wait-until-next-year," Sharry says. Which means that Schumer and his colleagues will have risked unveiling a premature bill a year before actual legislative action, giving opponents a year to rip the compromise apart. Already that's happening, with groups on both sides expressing outrage. Immigrant groups hate the idea of worker ID cards, and conservatives have pinned the label "amnesty" on provisions that give the estimated 11 million illegal immigrants in the country a pathway to citizenship. But if the immediate danger is to Democrats seeking Hispanic votes this November, the longer-term danger is to Republicans if they're perceived as blocking the legislation. The Arizona law, authored and passed by a Republican-controlled legislature and a Republican governor  means that the GOP starts this cycle with a black eye with the Hispanic community. "There's a great deal of pressure in the Republican Party to address it once and for all and move it off the table so they can start repairing their relationship with the Latino community," says Clarissa Martinez de Castro, director of immigration and national campaigns at the National Council of La Raza, one of the country's largest Hispanic advocacy groups. "Not doing so sets them on a suicidal course going into a presidential election." See pictures of the border fence rising in the Southwest.